I have discovered Sr. D'Armato has pasted his replies from Amazon.US over to my comments here. Not sure how long they have been there. But I still have not so much time to go through and give them the time and space I would like to. I used much time to give my views in the first place. The latest book awaits close perusal but I have other fish to fry just now. Actually, I was really trying to blow the bloody doors off! If I just accept them as comments here on blogspot they seem to disappear onto the pages they are aimed at and they are incomplete . error in copy pasting for some reason. What to do ? I have accepted them as comments as they are but you should go to AMAZON.US to the book reviews of the relevant Ospreys for Sr.D'Amato's complete posts. Despite of your reluctance to show o Amazon your critics, what it is perfectly understandable, I have copied the many and posted here with my comments. I have omitted, when possible, your jokes and laughs, according to me only reflecting an instable and frustrate personality, touched with infantilism. Let’s begin with the critics to the Dromōn. Yes, the battle is Sena Gallica, 551, but the description of Procopius allows, according to me, the possibility to recreate a sensate reconstruction, based, as it is based here, on sources, and not a phantasy scene as You are calling it. You are saying: “My criticism of the galea-bireme-dromon ship stands. Elsewhere, Procopius clearly states that the ships of Belisarius reconquista were single-banked, cataphract, with possibly a lateen rig. (History of the Wars, Book III, xi). These were called dromon(es)” Although Procopius says (Procopius, DBV, 1,11) in the precise exposition of the expedition against the Vandals that the ships of on"
Here, here I say. And just have to add..Is that reflex artillery shooting Greek fire ? Frustration. Yes, explicit I would think in what i blogged. At least, I hope so or I wasted all that sarcasm. Infantilism. Difficult one. Let others judge. Instability. Language divides us again. In this way readers can easily have access to Sr. D'Amato's views on things and not just the view frm my jaundiced eyes while my gout agues me in the twilight of my years and until my arthritic hands can clunk over the keyboard again. 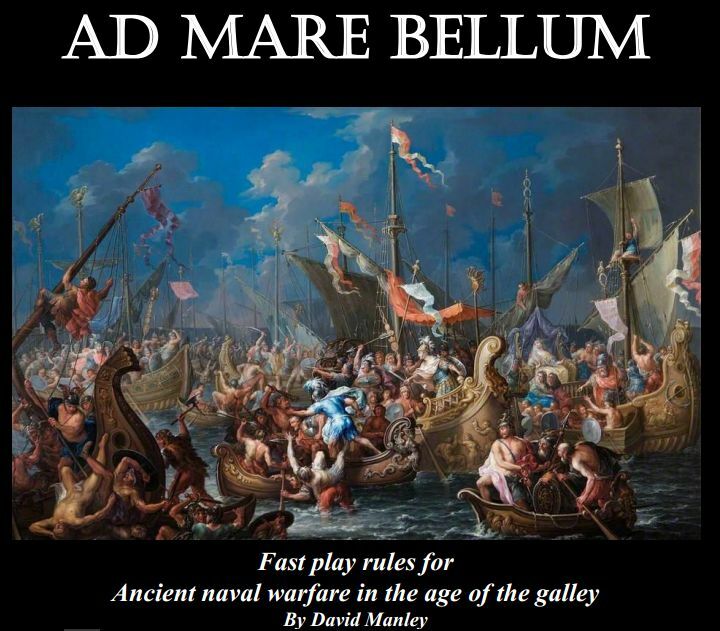 'War at Sea' is the title of a new set of 'quick play' rules from David Manley. They are designed for 1/1200 models and a small table but can be used with 1/600. They can be got for almost no money at Wargame Vault so there is no real excuse for not investigating them, at least. - They cost less than a single large galley model !!! 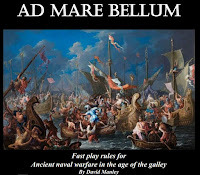 The emphasis is on a workable game which, while not a simulation, gives a feel for ancient galley warfare. Beyond the ship scale there are no scales given. The whole effect is a little abstract, especially when one looks at the ship characteristics. But if this is done to make a playable game it can be worth it. The presentation is an A4 PDF with some colour illustrations, figures, tables and Quick Play sheets. The rules are concise and readable. Some comments are given to explain or support interpretations given in the rules. N.B. If you make a set of PDF rules it is a bad idea to use a solid colour background anywhere in the design. Home printers get drained easily. The ship types table includes types from the Bronze age through to early medieval times so you can try Sea Peoples against Vikings if you so desire. Movement is easy with all types having the same manoeuverability, just differing speeds. 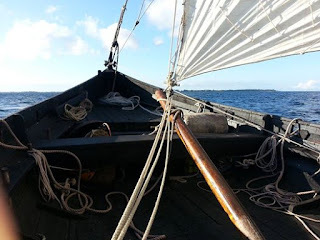 Sailing is simplified so that one cannot raise or lower sail during the battle (? as far as I can see?) nor can galleys - or round ships - tack, apparently. All combat mechanisms are simple and use a single D6. Results are not nuanced, as one says these days. But this is what one wants for many ships and short playing time ( and reduced brain fatigue). To further help reduce brain ache there is almost no book-keeping, only 5 types of marker being required or a ship status chart. I can forsee a horrible day for the Carthaginian player when he looks helplessly on as the Roman draws all 3 action cards in succession and wipes out all ships within range. Morale is elementary with a 50% rule but some variation is added by the possibility of giving squadron commanders different characteristics such as 'artillry expert' or 'Bloodthirsty' - which affect their scope for action in the game. I will make some test games in the next few days and report back.